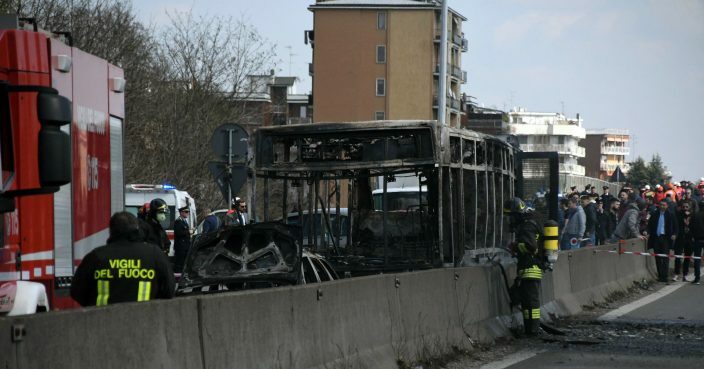 A bus driver in northern Italy abducted 51 children and their chaperones Wednesday, ordering the children's hands to be bound and threatening them with death during the drive, before setting the vehicle on fire when he was stopped by a Carabinieri blockade. Officers broke the glass in the back door of the bus and got all the passengers to safety without serious injury before the flames destroyed the vehicle, authorities said. As he was apprehended, the driver said he was protesting migrant deaths in the Mediterranean, Commander Luca De Marchis told Sky TG24. De Marchis told Sky TG24 that the driver, an Italian citizen of Senegalese origin in his 40s, threatened the passengers, telling them that "no one would survive today" as he commandeered the bus carrying two middle-school classes in Cremona province, some 40 kilometers (25 miles) from Milan. ANSA quoted one of the students as saying the driver took all their phones and ordered the chaperones to bind the students' hands with cable ties, threatening to spill gas and set the bus ablaze. The student, whose name was not given, said a classmate managed to conceal his phone. "While two officers kept the driver busy — he took a lighter and threatened to set fire to the vehicle with a gasoline canister on board — the others forced open the back door," De Marchis said. While the evacuation was underway, the driver started the blaze. De Marchis credited the officers' "swiftness and courage," for getting out all the children and their teachers "with no tragic consequences." The driver was apprehended and was being treated for burns. ANSA identified him as Ousseynou Sy, and said he was being investigated on suspicion of kidnapping, intention to commit mass murder, arson and resisting law enforcement. De Marchis said he had previous convictions, but did not specify their nature. ANSA reported that Sy, who became an Italian citizen in 2004, had been convicted in 2007 and 2011 of drunken driving and sexual molestation of a minor. Sky TG24 said that the driver had worked for the bus company for 15 years without any employment-related issues. 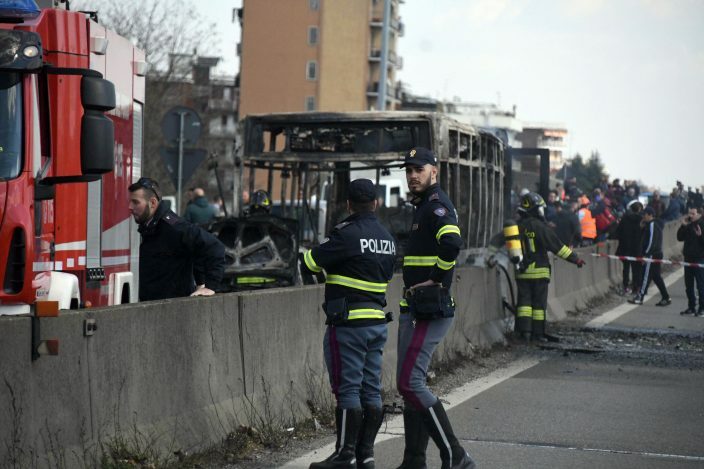 "Investigators must clarify how the transport company permitted such a delinquent ... to drive a bus, especially one carrying children," said Riccardo De Corato, a Milan provincial official for security. Two women fight fiercely and one is stripped off!